We’re excited to partner with StarVista Entertainment/Time Life to offer a giveaway opportunity for Mama’s Family – Season Six DVD, the final season of the classic Vicki Lawrence sitcom. Three lucky readers will win the newly released three-disc complete six – and FINAL – season DVD. 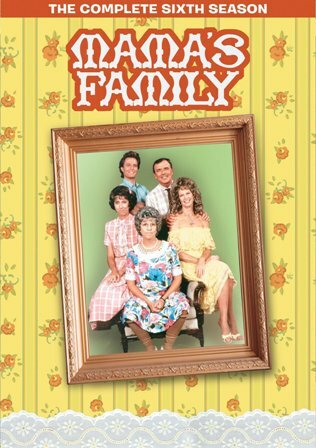 Mama’s Family – Season Six is currently available to own, visit Amazon to order. Three will win Mama’s Family – Season Six on DVD. Enter using the Rafflecopter form below (U.S. entrants only, no P.O. boxes) by February 20, 2015. The three-disc set includes all 20 episodes from the hilarious sixth season (1989-90), and features bonus interviews with interviews with Vicki Lawrence and Rick Hawkins, Executive Producer; Jim Evering, Producer & Writer; Manny Basanese, Writer, and Bob Mackie and Ret Turner, Costume Design. Three lucky winners will be drawn at random and notified via email. The winners will each have 48 hours to respond to our notification with their complete name and U.S. mailing address (no PO Boxes). Failure to respond within 48 hours will result in forfeiture and another winner will be selected. For complete giveaway rules, click Giveaway Rules and Restrictions. Empty Nest spun off the Golden Girls. The Jeffersons from All in the Family. Cinema Lowdown by Cinema Lowdown is licensed under a Creative Commons Attribution-NonCommercial-ShareAlike 4.0 International License. Based on a work at http://cinemalowdown.com. Permissions beyond the scope of this license may be available at http://cinemalowdown.com.